Author: S.Chekanov, A.Kotwal, J.Zuzelski, etc. This is FCC-h like detector based on the Silicon Detector (SiD). Currently it is smaller than the baseline design (similar to ATLAS detector), but it features large solenoid field (5T) and high-granullar tracker and calorimeters. It includes several modification to allow high-pT measurements at FCC-hh. In particular, it has 64 layers for HCAL with 5x5 cm (RegularNgonCartesianGridXY) cell size using scintillators, and ECAL based on 2x2 cm cell size (EcalBarrelCartesianGridXY). ECAL is close to 35 X0. HCAL is 11.25 interaction length (lambda), 0.176 lambda/layer. The total calorimeter thickness is about 12 lambda. The total size of the calorimeter is increased by a factor of 2 for the z-axis, compared to SiD. The total size of the detector is increased by a factor of 2 for the radius, and a factor of 3 for the z-axis (in comparison with the sidloi3 detector) making the total 2m in radi and 6m in length. The inner Vertex Barrel is unchanged as is the beampipe vacume. The inner Vertex Endcap Modules are increased in Z by varrying factors and increased in inner (and outer) radius as to not intersect the beampipe; additional modules were added to decrease gaps and increase accuracy. The outer vertex tracking is increased by a factor 3 in Z compared to the SiD, the outer traBeamPipeVacuumcker was also increased to provide a good coverage in the barrel region. The tracker barrel modules are also increased by varrying amounts per layer to decrease gaps and and increase accuracy. The outer endcaps are moved away by a factor 3 and increased in radius by a factor of 1.6. Some of the outer VertexReadouts are scaled by 3 in Z and by 1.6 in radius. This version is based on fastPandora Most all supports are scaled to fit their components. Min number of hits for track reconstruction is above 6. Min pT for tracks is 500 MeV. Mip values were for ECAL/HCAL were corrected based on single muon samples. Unlike other releases, this detector uses fast PandoraPFA (latest version) using fpadsim-1.1 simulation packages. The changes were done by John Marshall. Please check config/ for settings used by Pandora. This detector is described in .V. Chekanov, M. Beydler, A.V. Kotwal, L. Gray, S. Sen, N.V. Tran, S.-S. Yu, J. Zuzelski. 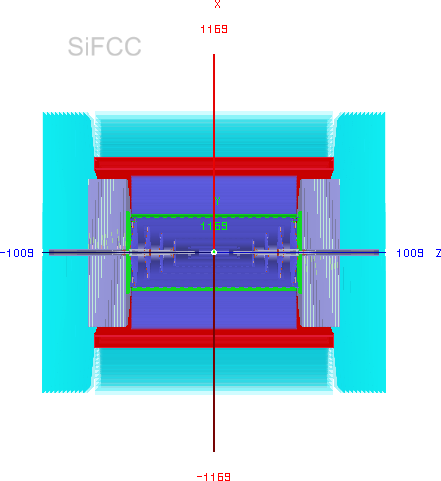 Initial performance studies of a general-purpose detector for multi-TeV physics at a 100 TeV pp collider. Dec 2016, https://arxiv.org/abs/1612.07291. Published as JINST 12 (2017) P06009.